Decorative mosaic plaster containing specific substances, used on internal and external surfaces. On different surfaces, such as plaster, concrete, wood, panel, etc. Preparation of surface. The surface should be totally free of oil, rust, paraffin, and other residues preventing adhesion. 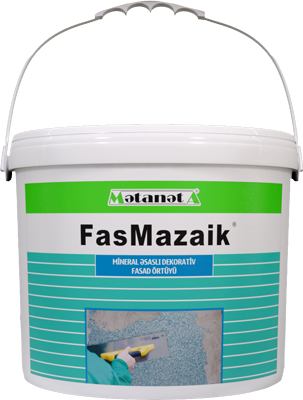 In case the surface has cracks or pores, it should be repaired with F-Pas facing paste. The surface should first be primed with Binmader primer, and decorative plaster should be applied to the surface after the primer gets dry. Preparation of mixture. Thoroughly mix the decorative plaster using poor circulation mixer. To regulate the applied product density add water in small amounts (at most up to 1% of the product). Application. Apply the decorative plaster using stainless steel trowel in the same direction provided that there is no air gap, and then polish. 1 m2 surface can be plastered with 3 kg decorative plaster in 2 mm thickness. The product can be stored during 24 months in unopened sacks in dry conditions. parameters indicated above were received on the base of laboratory tests conducted in the ambient conditions of +230C±20C temperature and 50% + 5% humidity. Depending on the ambient conditions these parameters may be changed. For technical support or more information please do not hesitate to contact “Matanat А" company!